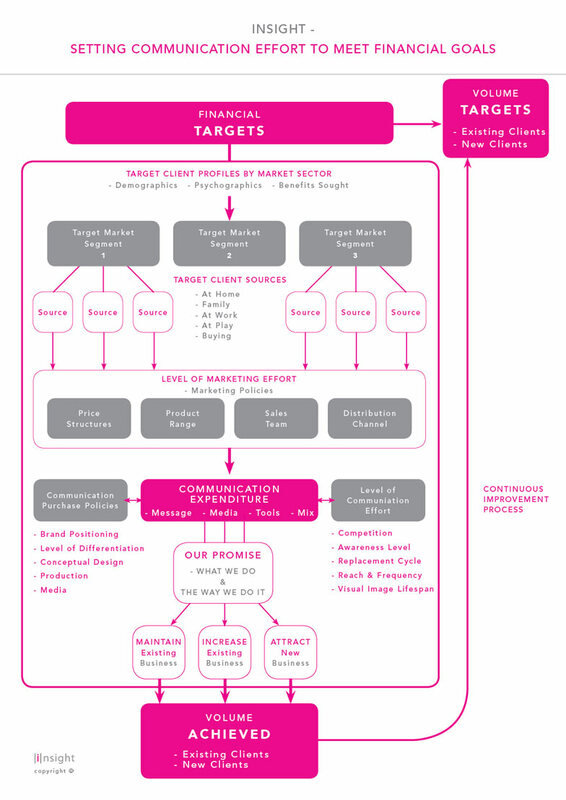 Insight’s ROI Approach is designed to deliver Communication Effectiveness. 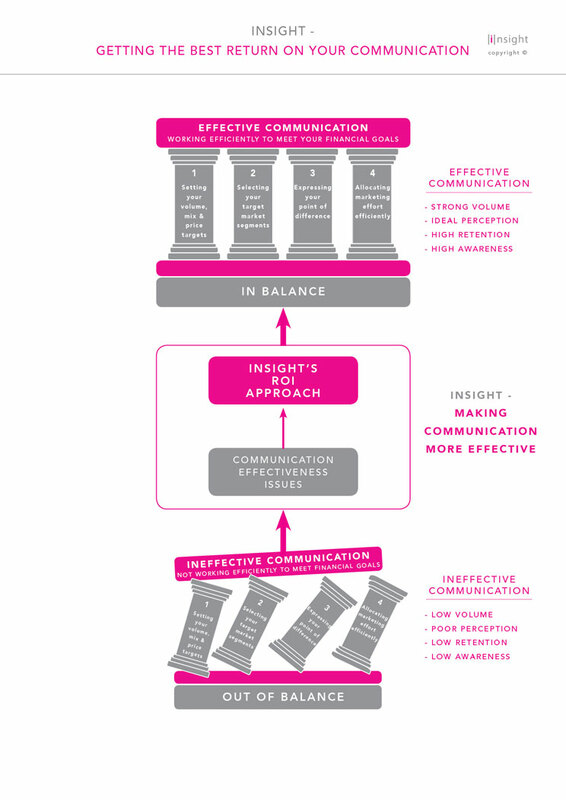 Effectiveness only occurs when the 4 Pillars of Communication Effectiveness are in balance with each other. The diagram illustrates these 4 Pillars. Insight’s ROI Approach takes into consideration the key issues that underlie each one of the 4 Pillars. These ‘key issues’ are outlined in more detail below. How many enquiries must be generated? What prices are our clients willing to pay for our range? How frequently will our clients buy? How much volume will be generated from each business source? How much will be bought from each part of the distribution channel? How much volume comes from new clients? What are the characteristics of the people who will buy our goods or services? From whom can our target clients buy? What are our target clients going to buy? For what purpose are our target clients buying? What benefits are our target clients seeking? From where will our target clients buy? How ready are our target clients to buy? Can our clients be induced to speed up their purchasing process? What are the best sources of business? What is the ideal brand image which we must project to our market segments? Does the message clearly state the target markets’ problems and the benefits our solutions deliver? Does the communication show how we do business differently from our competitors? Do our points of sale really deliver our promised differences? Does the media selected match our target markets’ media usage habits? Does the media selected exploit the differences between us and our competitors’ communication mixes? How well does our communication grab, hold and maintain attention? Is our message believable, with inherent credibility? How well does the message convince and lead our customers to buy? Does the communication arouse a positive emotional response in itself? 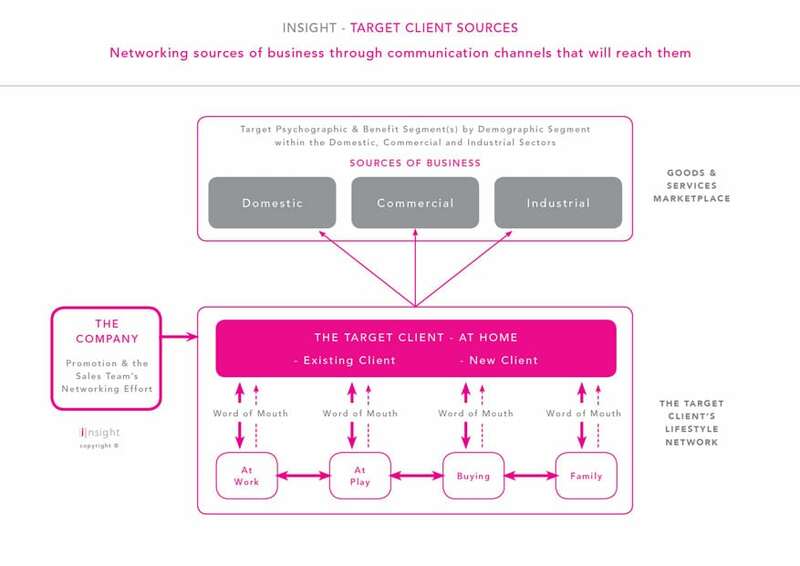 Can our target clients identify themselves, from the communication, as the person to whom we are talking? What measures are we using to optimise the communication mix? What reach and frequency must we have to achieve our enquiries target? How should we determine the most effective level of communication expenditure? How much expenditure must we allocate to maintain current business, to increase business from existing clients and to attract new clients? How much business will this year’s expenditure bring in next year? What are our most efficient purchase policies and procedures for media and promotional material? Are we breaking through the competitive noise level? How well do we deliver our promises? How well do we monitor the information required to fine tune our communication effectiveness?